If you're looking for a great (and cheap!) hotel in Venice, CheapTickets is the best place to find them. We offer deals on the best 1340 hotels throughout Venice. No matter what you're looking for, we have options for you. Grab great rates on the 199 affordable 3-star hotels that are easy on the wallet without sacrificing comfort. Looking for more luxury? Try one of the 131, 4-star hotel accommodations in Venice. No matter your budget needs, we've pulled out all the stops to make sure you have plenty of vacation options. Maybe you prefer to search for your hotel deals based on what each hotel offers? For example, let's say you just want to find a hotel or resort that has a pool to cool off in after a long day exploring Venice. Scroll down to choose from the 46 hotels in Venice that has a pool for guests. Or search for deals on Venice hotels offering free wifi or breakfast, non-smoking rooms, and more! CheapTickets is here to be your personal travel agent for your next trip to Venice. Get booking today! What hotels in Venice offer free wifi access? Are there deals on Venice hotels offering free breakfast? Yes! The only thing better than finding a great deal on a cheap hotel in Venice is finding one that offers free breakfast. Grab some eggs, a waffle, or some healthy oatmeal before a day full of exploring Venice and all that it has to offer. Below are just some of the many hotels that offer free breakfast in Venice. 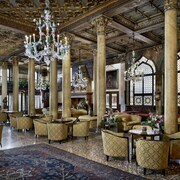 Pesaro Palace is a 4.00 star rated hotel property in Venice that offers free breakfast. Hotel Canal Grande is a 4.00 star rated hotel property in Venice that offers free breakfast. Hotel Dei Dragomanni is a 4.00 star rated hotel property in Venice that offers free breakfast. 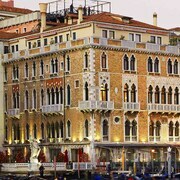 Hotel Palazzo Abadessa is a 4.50 star rated hotel property in Venice that offers free breakfast. What about deals on pet-friendly hotels in Venice? Venice is a great place to get outside and explore with your pets in tow so don't leave your furry friends behind. Below you'll find great deals on hotels in Venice that allow pets. Don't forget to bring plenty of treats! Hotel Ai Reali di Venezia is a popular, pet-friendly, 4.50 star hotel in Venice. Holiday Inn Venice-Mestre Marghera is a popular, pet-friendly, 4.00 star hotel in Venice. 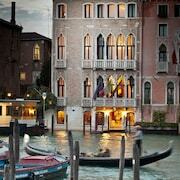 Hotel L'Orologio Venezia is a popular, pet-friendly, 4.50 star hotel in Venice. Hotel Antiche Figure is a popular, pet-friendly, 3.00 star hotel in Venice. Any good rates on Venice hotels with restaurants? Absolutely. Don't want to deal with planning our all your meals on your trip to Venice? We don't blame you. Keep the hangry away by staying in one of the 152 hotels that have restaurants. With a room at one of these spots, all it takes to get a good meal is hopping in the elevator. Check out some of the most popular hotels in Venice that have restaurants below. Book Palace BonvecchiatiPalace Bonvecchiati is a 4.00 star hotel and has one or more restaurant options. Book Hotel Cavalletto e Doge OrseoloHotel Cavalletto e Doge Orseolo is a 4.00 star hotel and has one or more restaurant options. Book Royal San Marco HotelRoyal San Marco Hotel is a 4.00 star hotel and has one or more restaurant options. Book Ca' Pisani HotelCa' Pisani Hotel is a 4.50 star hotel and has one or more restaurant options. What are the cheapest hotels in Venice with pools? What's better after a long day exploring Venice then a relaxing dip in a pool? Finding the Venice hotel you need for a bargain! Cool off and unwind at one of our 46 Venice hotels with a pool. Browse some of the top deals on these hotels and resorts with pools in Venice below, but be warned: You may not want to check out! Antony Palace Hotel has a pool and a 4.00 star rating. 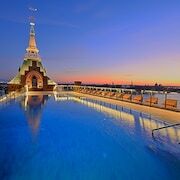 Splendid Venice Venezia - Starhotels Collezione has a pool and a 4.00 star rating. Hotel Ai Reali di Venezia has a pool and a 4.50 star rating. Best Western Plus Hotel Bologna has a pool and a 4.00 star rating. What hotels in Venice offer parking for guests? Once you've made your way to Venice, the last thing you want to deal with is finding parking close to your hotel. Avoid the hassle of parking around the block and carrying your luggage all the way to the lobby by booking one of our hotels with parking. Check out deals on some of the 216 hotels in Venice that offer parking for guests. Carnival Palace Hotel This hotel has a 4.50-star rating. Hotel Arlecchino This hotel has a 3.00-star rating. 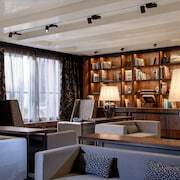 Hotel San Cassiano Ca'Favretto This hotel has a 4.00-star rating. Best Western Titian Inn Hotel Venice Airport This hotel has a 3.00-star rating. Do Venice hotels offer 24-hour concierge services? When you're on vacation, things don't always go according to plan. Travel with peace of mind when you book one of our 310 hotels in Venice with 24-hour concierge service. That way you know help is always phone call or elevator ride away. Try Santa Chiara Hotel. It's a 4.00 star rated hotel in Venice that offers concierge services 24 hours a day. Try Colombina Hotel. It's a 4.00 star rated hotel in Venice that offers concierge services 24 hours a day. Try Albergo Bel Sito e Berlino. It's a 3.00 star rated hotel in Venice that offers concierge services 24 hours a day. Try Hotel Marconi. It's a 3.00 star rated hotel in Venice that offers concierge services 24 hours a day. What about low rates on non-smoking hotels in Venice? Hotel Rialto This hotel has a 4.00-star rating. Bellini This hotel has a 4.00-star rating. Hotel Tritone This hotel has a 4.00-star rating. Hotel Le Isole This hotel has a 3.00-star rating. What are the cheapest Venice 3-star hotel deals? Our 3-star hotels bring you quality accommodations at a lower price point for the perfect, budget-friendly vacation in Venice. With 199 3-star hotels throughout Venice to choose from, you still have options. Browse our selection below. Hotel Antiche Figure. Set at the start of the Grand Canal in Venice, this recently renovated 3-star hotel in a 15th-century building is 100 meters from Piazzale Roma (airport bus terminal) and opposite the railway station. Hotel Ala. Located in San Marco, this hotel is within a 10-minute walk of Santa Maria del Giglio, St. Mark's Basilica, and Basilica of St Mary of Health. St. Mark's Square and Academy Gallery are also within 10 minutes. Hotel Olimpia Venice. This Venice hotel is near Piazzale Roma, and within one-half kilometer of Giardini Papadopoli, Scuola Grande di San Giovanni Evangelista, the Church of St. Roch, and Scalzi Bridge. The cruise ship/ferry terminal and the train station are also located nearby. Pensione Accademia Villa Maravege. Located in Dorsoduro, this hotel is steps from Academy Gallery and Ca' Rezzonico. Peggy Guggenheim Museum and Basilica of St Mary of Health are also within 15 minutes. What are the best deals on 4-Star Hotels in Venice? Venice is full of hotels and it can be hard to narrow down where you really want to stay. Luckily, we've done that hard work for you be narrowing you from 1340 hotels throughout Venice, to the 131 4-star hotels in Venice. Our 4-star hotels in Venice are exactly what you need for your next family trip, romantic weekend, or solo getaway. Check out our most popular deals below. Hotel Ai Reali di Venezia: This family-friendly Venice hotel is located in the historical district, just steps from Le Zitelle and Rialto Bridge. St. Mark's Basilica and Basilica di San Giovanni e Paolo are also within 10 minutes. Carnival Palace Hotel: Located in Cannaregio, this romantic hotel is within 1 mi (2 km) of Guglie Waterbus, Rialto Bridge, and Ca' d'Oro. St. Mary of the Friars and Basilica di San Giovanni e Paolo are also within 1 mi (2 km). Hotel Dei Dragomanni: Located in San Marco, this hotel is steps from Santa Maria del Giglio and Basilica of St Mary of Health. St. Mark's Basilica and St. Mark's Square are also within 10 minutes. Hotel L'Orologio Venezia: Located in San Polo, this luxury hotel is steps from Pescaria and Ca' d'Oro. Rialto Bridge and St. Mark's Basilica are also within 15 minutes. What are the best activities to do in Venice? 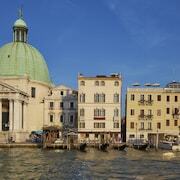 Combo Saver: Walking Tour & Grand Canal Boat Cruise: Starting at just $79 per person. Small-Group Grand Canal Boat Tour: Starting at just $57 per person. Hill Towns of Veneto Tour: Starting at just $183 per person. Dolomites Full-Day Tour: Starting at just $183 per person. Basically arrived at hotel and they tried to give us a room in another building, an old building with no light on ground floor which smelled of sewage. Apparently you need to read the small print! Although at first they did say we could upgrade for a further 100 dollars per night. I immediately phoned cheap hotels and got a room in the main hotel without paying additional 100, I had already paid 300 dollars per night. This is fraud. Beware of this hotel's tactics. Breakfast was not great either bread and croissants not fresh. Location too far from the centre. Nice hotel conveniently located to Venice entrance and the Ghetto. Staff is very helpful. Fantastic location in Castello neighborhood. FANTASTIC Hotel Staff -- both gentlemen named Alvese are the "go tos" at the hotel. Terrific hotel, Very comfortable. Outstanding attentive staff. Excellent breakfast. Very quiet. The hotel is finishing a remodel, which was the only slight item keeping it from perfect, and I imagine it will be perfect when completed.